By Graham Young - posted Monday, 24 January 2011 Sign Up for free e-mail updates! It’s an ill wind that blows no one any good, and the winds that brought the rain and devastation to Queensland are no exception. While they left many homeless, they may have done some good for Queensland Premier Anna Bligh. Her handling of the flood crisis has widely been hailed as inspirational with commentators suggesting it gives her a chance of retaining her grip on parliament house. But how good a chance is it? The latest Newspoll has Queensland Labor on a primary vote of 26 per cent and the LNP on 45 per cent, yielding a two-party preferred result of 59 per cent to 41 per cent. 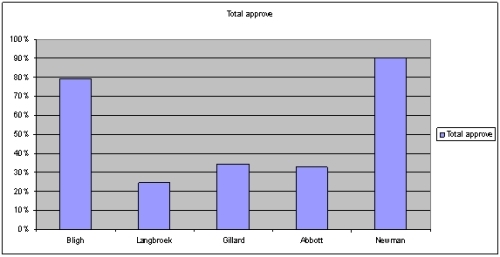 Only 24 per cent approve of Bligh as premier. If it carried over into the next election Labor would go close to equaling its worst-ever result of 1974 when it was reduced to only 11 members: a prospect The Courier Mail calls “Annageddon”. We did a qualitative poll of 525 opinion-leading Queenslanders earlier this week and it suggests that our punters partly share the views of the pundits. They certainly saw Bligh’s performance during the floods as exemplary. When we asked our panel specifically in relation to the floods whether they approved of the premier’s performance 79 per cent did and 8 per cent didn’t. That’s a very high mark, but it needs to be put into perspective. We also asked respondents to rate their local mayor. In this case across the state 83 per cent approved while 6 per cent disapproved. Some mayors did better than others, with Brisbane’s Lord Mayor Campbell Newman scoring 90 per cent approval and only 5 per cent disapproval. And as a further control we also had them rank Julia Gillard (35 per cent), Tony Abbott (33 per cent) and State Opposition Leader John Paul Langbroek (24%). So while Bligh did well, she isn’t best of class, but she could also easily have done much worse. Respondents described her as “Calm, well-briefed, sensitive, measured, not point scoring, showing leadership, efficient, having a good media presence, honest, not defensive…”.